I first read this book several years ago on several consecutive Saturday mornings with some friends as we all attempted to learn a little more about a long passed over aspect of our church history. Reading this book again highlighted a few things that make this book worth reading. For one, knowing more about the early church is really important in our church history and gives us incredible insight into several areas: New Testament understanding, Christian wisdom and living, Christian spirituality, defending the faith, and it corrects many bad presentations of this time period such as we saw several years ago in The Da Vinci Code. Another worthwhile point of reading a book like this is that it is an introductory level book by a clear and engaging scholar. I have read Haykin on various English Baptists, such as Andrew Fuller and his friends, and always appreciated how he communicates even the mundane details in a compelling way. 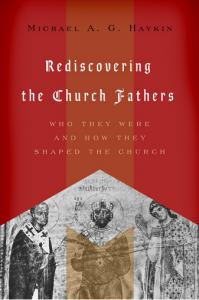 Plus, Haykin is writing this book to introduce the 21st century church to an aspect of church history which when understood gives great practical value. One final reason why this book is worth your reading is that it gives fascinating history. Ignatius of Antioch, Origen of Alexandria, Basil of Caesarea, and even the famously (mis)known St. Patrick are all presented and discussed. Now let me give you one of my favorite parts: Origen and his exegesis! Origen is most famous for his allegorical interpretation of Scripture. Why would I enjoy that part? Because, Origen sees the entire Scriptures (in every word) as coming from the Holy Spirit who also indwells believers today. Thus, Origen asserted that the Spirit-filled believer ought to and must be constantly spiritually formed by the Spirit-sourced Scriptures. I don’t follow all the way to the allegorical methodology of Origen, but this conclusion of Haykin is excellent: “Exegesis has an important spiritual component. The Bible interpreter seeks to understand the text, but this task of interpretation cannot occur in an existential vacuum. While he is reading the text and laboring to understand its meaning and application, the text has its own work to do in shaping the character of the exegete” (p. 90). Amen.